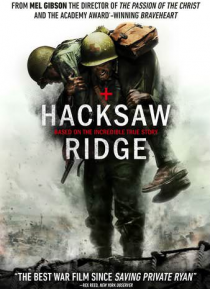 HACKSAW RIDGE is the extraordinary true story of Desmond Doss (Andrew Garfield) who, in Okinawa during the bloodiest battle of WWII, saved 75 men without firing or carrying a gun. He was the only American soldier in WWII to fight on the front lines without a weapon, as he believed that while the war was justified, killing was nevertheless wrong. As an army medic, he single-handedly evacuated the w… ounded from behind enemy lines, braved fire while tending to soldiers, was wounded by a grenade, and hit by snipers. Doss was the first conscientious objector to ever earn the Congressional Medal of Honor.